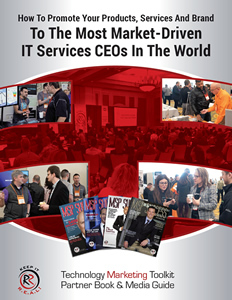 Without a doubt, sponsoring targeted IT industry events should be in the marketing budgets for any company serious about selling through VARs and MSPs. For starters, it is one of the fastest ways to gain brand recognition, launch new products, generate LEADS and SALES, as well as engage current clients. Events give you the unique opportunity to gauge industry interest direct by having productive conversations with the decision makers you’re trying to attract (after all, they can’t hide behind a voice mail or spam filter, and they are more likely to have longer conversations with you). It’s also a tremendous way to “spy” on your competition, stay on top of industry trends and news, and keep a pulse on what’s going on “out there” in this fast-changing, ever-evolving industry. Further, many MSPs and IT services CEOs come to events to “shop,” actively LOOKING for new companies’ products and services. But sponsoring events can be costly, which is why you want to choose carefully which events you sponsor. “Cheap” sponsorships and “affordable” events aren’t always the “best.” After all, you get what you pay for, as we all know, AND you are aligning YOUR BRAND with the branding of the event. If the event is not too stellar from the attendee standpoint, you get unfairly lumped into their failure. In addition to the sponsorship fee itself, you’ll also incur costs for shipping and setting up your booth, travel expenses and materials, not to mention the time invested in preparation and being out of the office. A general rule of thumb is that whatever you invest (spend) on the sponsorship itself, you should budget at least that same amount into these other things. Failure to budget properly could mean you don’t get the impact and ROI you were hoping for. What is the breakdown of the role of the attendees? Are they the decision maker? What makes the attendees unique? Why are attendees coming to the event? Where is the trade-show floor? In a different room? How far/close is it to the flow of traffic of the attendees? Are any of my competitors there? Will my booth/session be competing with theirs? Do you offer pre-event marketing or on-site activities to drive people to my booth? How am I permitted to gather names/business cards of attendees to build a list?